SLOGANS in favour of Prime Minister Narendra Modi were raised at an event organised for Congress President Rahul Gandhi here on Friday. Gandhi interacted with students of different institutions. 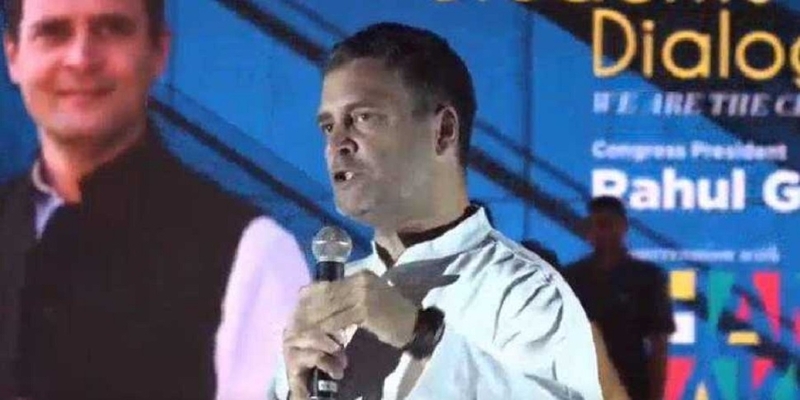 Some students started raising slogans of ‘Modi, Modi’ when the Congress President said that he had no hatred for anyone including Prime Minister Narendra Modi. “I have no anger or hatred towards Narendra Modi. He has anger towards me,” he said as slogans in the favour of the Prime Minister were raised. “No problem,” he said as the students continued to raise the slogans. Gandhi talked about the state of the economy, unemployment job creation, demonetisation and about his party’s promise to give Rs 72,000 per year to the poor of the country at the event.